A late-night bibelot, courtesy The Verge. From the ridiculous to the sublime. This 24-minute video is infinitely more satisfying and insightful than Room 237. I had the opportunity to view LACMA’s Kubrick exhibit, and it was utterly fascinating. Now I hope to see the traveling exhibit again, this time with Adam Savage’s hi-fi maze model. He stated that the exhibit would be in San Francisco in 2016… so there you go. Awesomeness in under 90 seconds. Via Daring Fireball. As a big fan of Stanley Kubrick, arguably the greatest director of all time, I was eagerly anticipating Room 237 and wanted to make sure I saw it on the big screen. I was hugely disappointed. The documentary is comprised of interviews with a small group of Kubrick-leaning cinephiles that pick apart tiny details in The Shining and use them to justify various theories about the movie and Kubrick’s hidden messages. The most prevalent theme is that The Shining is really about the genocide of American native peoples and/or Holocaust victims. Another theory presumably presented as fact is that the footage of the moon landing was faked, and faked by none other than Kubrick himself. Supposedly there are all sorts of hidden jokes also present in The Shining, which are really easy to see once you start watching the movie at home frame-by-frame, a completely ridiculous supposition given that the movie came out in 1980 and was meant to be watched only in the theater. DVD did not exist then, and neither did widespread consumer VCR use, nor VCRs that could clearly pause movie frames. I am not saying there is no validity to any of the theories posited, but I am saying these people are reading way too much into the minutiae of the movie. And I’m also saying ‘so what?’ After having visited the fascinating LACMA Kubrick exhibit (still going a little while longer), I was hoping for more juicy insight into Kubrick and the movie-making process, more of the type of truly interesting discovery that I found in that exhibit. None of that is to be found in Room 237. What makes this movie even worse is that it is not even particularly interesting. Consider the mastery of great documentary film: The Thin Blue Line, Roger & Me, Bowling for Columbine, Catfish, Searching for Sugar Man. These films present their story in such a way as to develop character and plot in a way just as engrossing as good fictional drama. Truth is often stranger than fiction, and these documentaries fully exploit that concept. 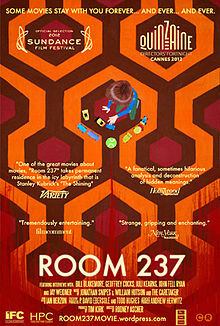 But not Room 237. It’s just the delivery of one hackneyed, minimally qualified idea after another which do very little to offer any true insight into The Shining or the making thereof. Looking forward to this documentary. Perfect timing given the on-going Kubrick exhibit at LACMA. Also check out my post from a few years ago on Kubrick’s movies, and more recently on The Killing. At some point I’ll revisit and expand on the Kubrick oeuvre as it is unequaled in the world of film. Credit to Daring Fireball. Having been re-inspired by the fantastic LACMA Kubrick exhibit [prior post], last night I watched Kubrick’s The Killing (1956, B&W, 85 mins, square A/R) which had lingered on my queue for too long. It was an outstanding, taut crime thriller film noir. It felt modern and fresh despite elements that would seem to date it: technology and manners of speech and society in the 50s — those elements that can sour lesser movies of the era that fall into obsolescence. Favorable comparisons can be made to Hitchcock crime thrillers, but also Fargo and even Pulp Fiction. Narration, which can be an absolute bane (Vicky Cristina Barcelona and Y Tu Mamá También as prime examples), is used here as an effective tool, combined with a stark directorial style to rapidly deliver the salient facts of the case at hand. Kubrick goes about in a mathematical way to present the story just as it is and let the action speak for itself. The story is about a group of men plotting out and executing the robbery of a horse racetrack’s cash-on-hand. 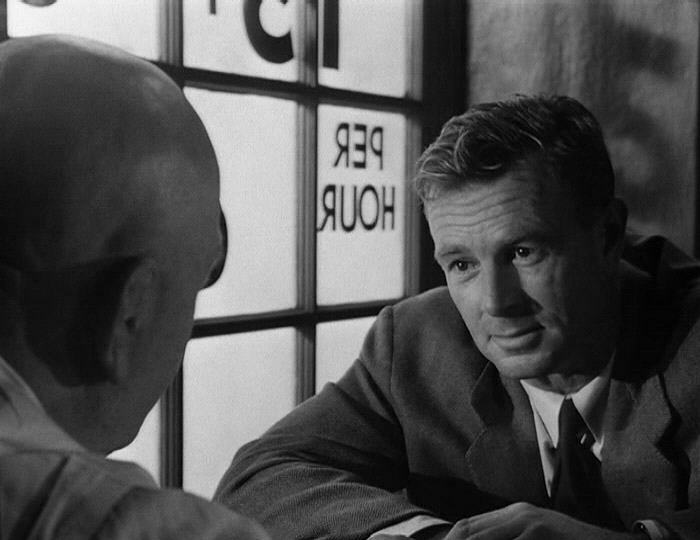 Despite the matter-of-fact way the story is presented, acting and character development are also at work, to the point that empathy is drawn around the ringleader Johnny Clay, played by Sterling Hayden. Just enough warmth builds around Clay and a few of the other characters to round out and make whole this great early effort by Kubrick. The Killing is an antidote to the languid non-stories often propagated in film nowadays; to borrow from AMC, “story matters here” — 8/10.